We’ve come a long way, but we still face great challenges and have big dreams. We have a ways to go if we are to advance the long-term wellbeing of LGBTQ people. Toward that end, Funders for LGBTQ Issues is reaffirming its commitment to strategically increasing the scale and impact of philanthropic resources for LGBTQ communities. 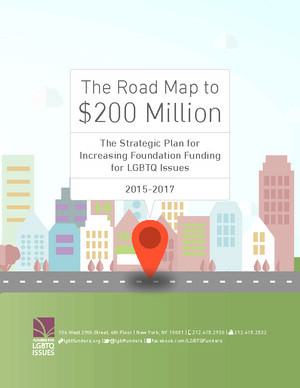 As part of a new, three-year strategic plan, Funders for LGBTQ Issues has set a bold goal of increasing annual LGBTQ philanthropic funding to $200 million by 2017.